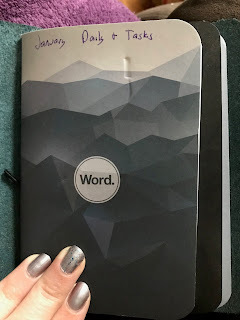 As mentioned last time, I want to talk about my Bullet Journal, and goals. 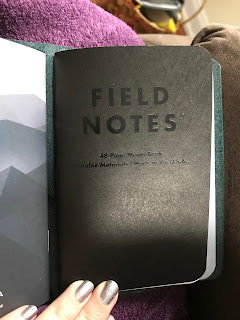 I started a Bullet Journal in late October after fate led me to read Ryder Carroll's book on the subject AND I found a gorgeous leather traveler's notebook case at SAFF on the same weekend. Also, I've been getting Field Notes' quarterly subscription a while and really needed to start using them. 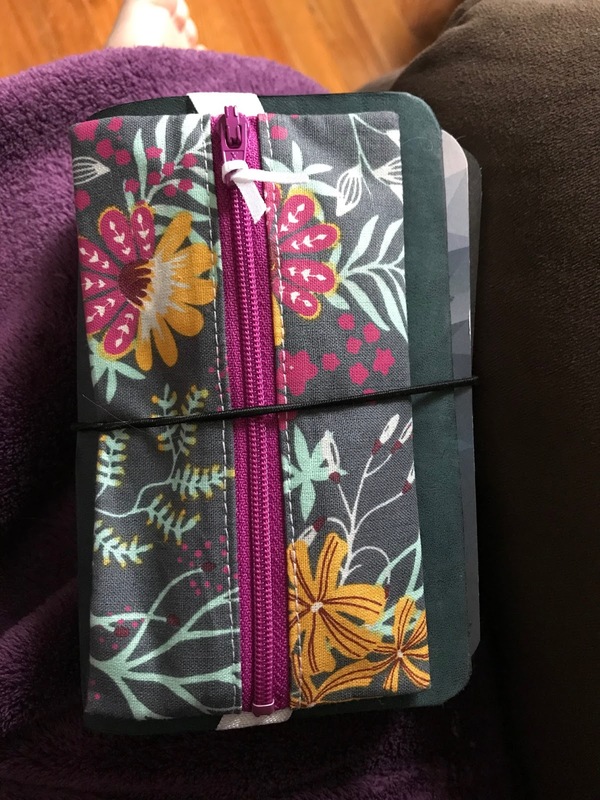 Later I was able to find this gorgeous fabric case to keep my pens handy. I use 3 notebooks for my Bujo. 1 is replaced every month. It has my Daily tasks & general to-do list. 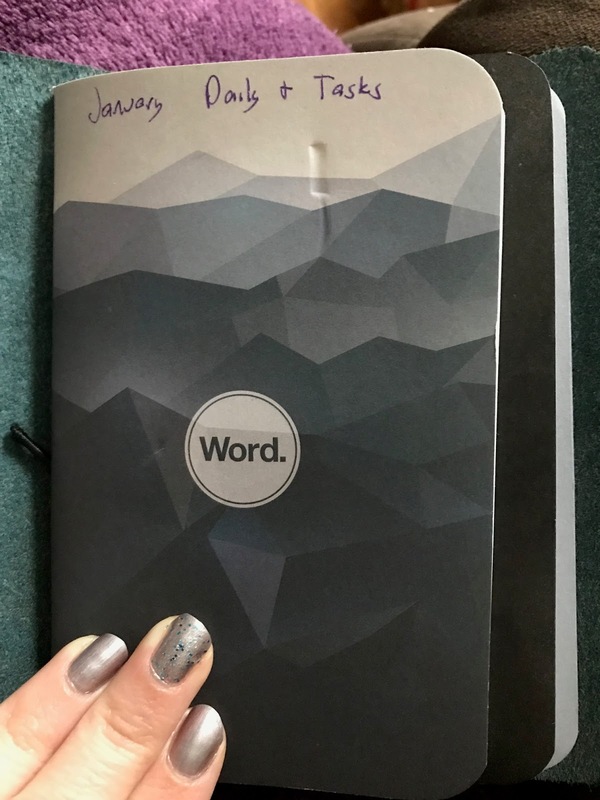 For this book I've been using Word Notebooks because they are already set up with the Bullet Journal method of tracking lists. On one page I have "Future Log - Adulting" where I keep track of things like work deadlines, cleaning tasks, appointments, and bills. 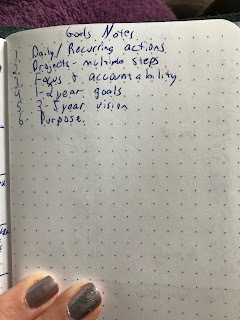 The second page I have "Future Log - FUN!" 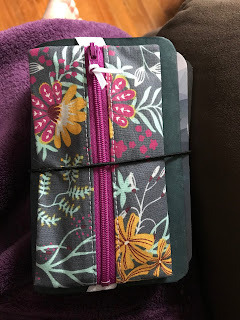 Where I keep track of things like Christmas gift knitting plans and entertainment schedules (I have names & other info on many pages, and bad handwriting, so I haven't shared images of most of my pages). After that comes my daily pages. 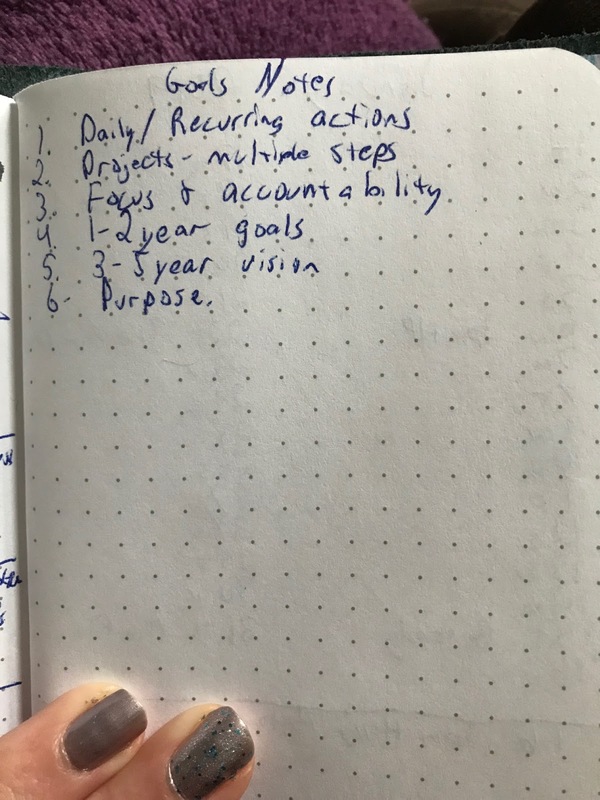 This is where the Bullet Journal method has helped me the most. I used to lay awake at night repeatedly thinking about what I had to get done the next day. Now, I spend about 10 minutes each night writing those tasks out for the next day. It gets the recurring thoughts out of my head and I can rest. As I complete a task I put an X by it. If I don't get it done, I put a sideways triangle indicating it needs to be copied to the next day. If you decide it doesn't really have to be done you can cross through it. 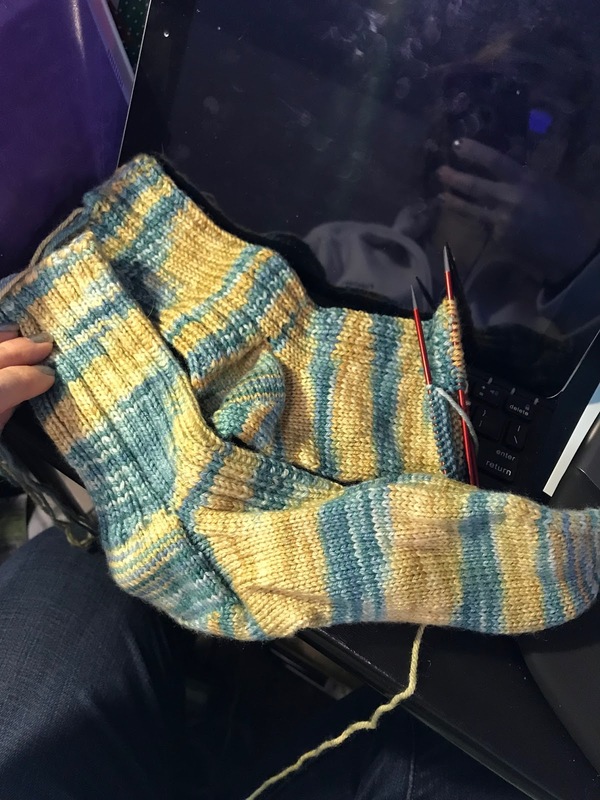 Things I've stolen from Amy Falcone are if you make progress on a task but don't get to complete it, put a sideways triangle and fill it in (filling it in indicates you got to do part of it, so it's less disappointing than an empty triangle). And, I set space aside at bottom where I put Daily Wins. Following the guidelines there, I've set Work & Personal goals. Daily/Recurring Actions. Work: Daily que & tasks, Project steps, Encourage self-sufficiency in co-workers. Personal: Drink a minimum of 64 oz water. Weight Watchers Points, and Complement/Verbally Appreciate someone. Projects - Multiple steps: Work: (Can't really go into detail here but there's 3 big projects to undertake this year). Personal: Use more of my yarn stash, Read more (audio counts), Declutter. Focus & Accountability: Work: Create 1 SOP per quarter, Train my backup on the task. Personal: Save $100 a month, Exercise more. 3-5 year goals: Work: Obtain designation for online courses, document all my processes & train backup. Personal: Go on a BIG TRIP, find a local church that feels like home. PURPOSE: Work: Be compliant, be Accurate, and Be Efficient. Personal: Be Inclusive, Be Encouraging, Be Healthy, and Increase Joy. After these goals I do a 1 page spread of the days of the month and which day of the week it lands on. I can keep a little note of an appointment there as well. The 3rd book is just for general notes, scribbles. When it fills up it gets replaced. One of the things I'm doing this year which supports my goals, is I want to support artists and makers and communities.I want to avoid Being Sold something. Online everywhere we constantly see sponsored posts and ads for things, and it makes it easy to just buy the thing because you want it. Above I linked to a local book store's online shop, and I've mentioned my friends' Patreons in this and my prior post. Hoping to increase joy and encourage good things and more mindful shopping rather than passive consumption. What are your goals? What helps you stay focused? Facebook recently reminded me it'd been 7 years since my next to last post!! I kept telling myself I needed to blog, but would put it off. Here's 1 big recap, and then hopefully I can get back to regular posting. So wow, a lot has changed in the last 7 years. Right around my last post we had just moved into a house. We are still here and it's definitely become home for the long-term. Also I have two nieces and a nephew, though if we're friends anywhere else you mostly only hear about my sister's daughter. Sadly, I've also lost in the last 7 years. My father passed away about a year and a half ago, and my grandmother had passed away a few months before that. So, since pictures tell a thousand words, I figure I'll stop blabbering on here, and just add a few photos from the last few years. Furbabies wait for Santa Tripsie now has to wear a cone full time because she'es allergic to everything, and licks herself raw. Knitted Dice bag for my DM (spoiler alert, dog ate it). Fore the Horde! Replaced the one the dog ate. DM and I Both enjoy Harry Dresden books. Most recent tattoo... it's about 6 years old now. Been busy enjoying my new home!! Tripsie on her fort, which she hasn't gotten back on since... not sure why. Tripsie in her favorite spot, the top of the stairs. Which I put together ALL BY MYSELF! The kitties have been staying cool by laying on the tile floor in the kitchen. The air vent is in the floor right between them. They both love to walk up to it and hold their faces right in the stream of cold air. Kitchen again, that screen in the dining room will hide the litter boxes from guests. 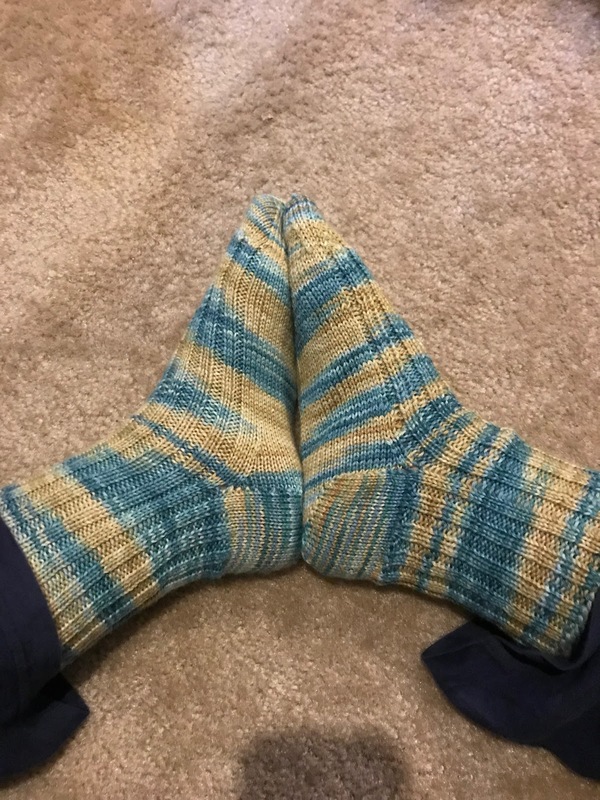 Decorating with knitting. My blanket I knit last year on the sofa. My wedding veil as a lace doily under my bouquet and a wedding photo. A centerpiece from our reception next to our wedding album Janine made. The prior homeowner left these shelves up! On the other shelf, a wedding gift from family, and our invitation in a photo frame one of my co-workers put together for me. Back in my knit nook, the left side of my desk. In the white boxes are undyed yarn & lace. Blue boxes mostly contain notions, one brown box holds (most of) my WIP bags, and there's sock yarn and cotton in the others. More yarn & more bags. What's that annoying whiney sound? Oh.. Hi Tripsie. Ok fine, I'll take your picture too. Tripsie has not adjusted as well as Kitty has. But then again she's never moved before other than coming to live with us. She cried all night for 2 weeks, and has done it again a few nights when we've had storms. But she's getting better. Now if we can get her to stop licking til she gets scabs. My (non-functional, decorative only) spinning wheel... i think some of the legs got mixed up, but it's too hot to mess with it right now. The right side of my desk. As you can see it's a little more "lived in" now. 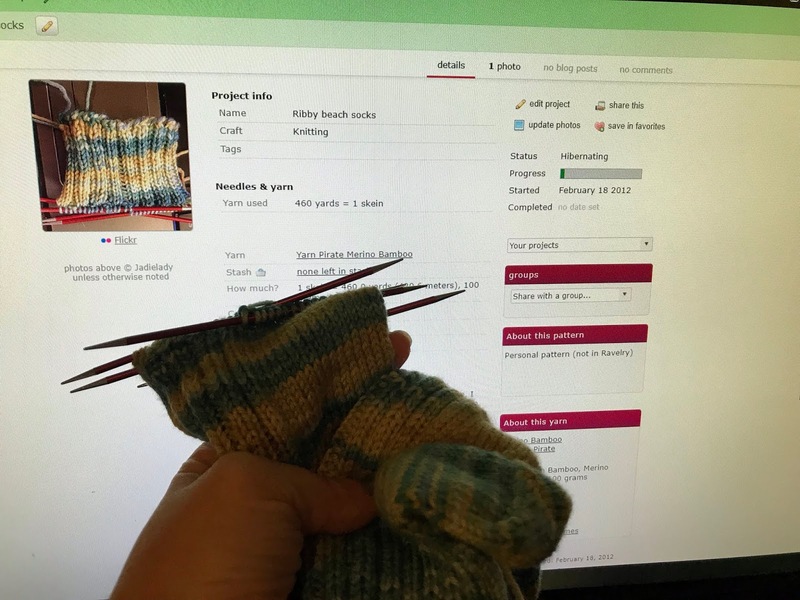 More notions, yarn, and my knitting books. And of course SNACKS! We've been enjoying our kitchen. Kitty has been very curious about the new surroundings. We love our new home SO MUCH. We didnt' have to do anything to it! Now to get back to knitting!